TEZZAH & BISH BASH BOSH MUSIC are pleased to be associated with the humanitarian associations of KARIMOC (France) and AL AMAL (Morocco). 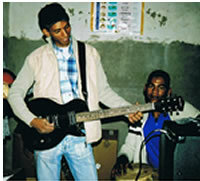 Pictured is a musician from the town of AKKA-IGHANZ, (Province de Tata, Morocco) playing a guitar & amplifier donated by TEZZAH & BISH BASH BOSH MUSIC. For more information on the work of these associations contact karimaroc@club-internet.fr direct or via the TEZZAH contact pages and we will pass on any messages.